Which font is used in Visual Studio Code Editor and how to change fonts? I tried Visual Studio Code editor(https://code.visualstudio.com/) which is recently announced at build. I tried it on Windows and Ubuntu. 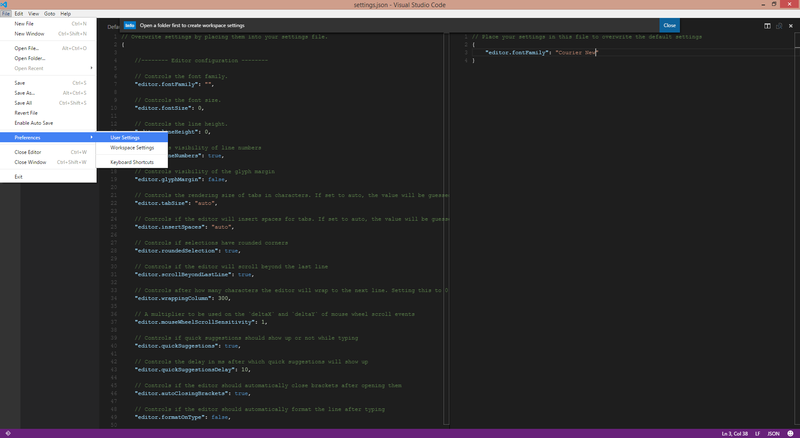 I can see that default font of Visual Studio Code Editor is not consolas which prefer on my code editors. So which is default font of Visual Studio Code Editor in All the environments(Ubuntu, MAC OS and windows)? And how can I change it? Then you can type inside the JSON object any settings you want to override. User settings are per user. You can also configure workspace settings, which are for the project that you are currently working on. // Controls the font family. How to verify: VS Code runs in a browser. In the first version, you could hit F12 to open the Developer Tools. Inspecting the DOM, you can find a containing several s that make up that line of code. Inspecting one of those spans, you can see that font-family is just the list above. 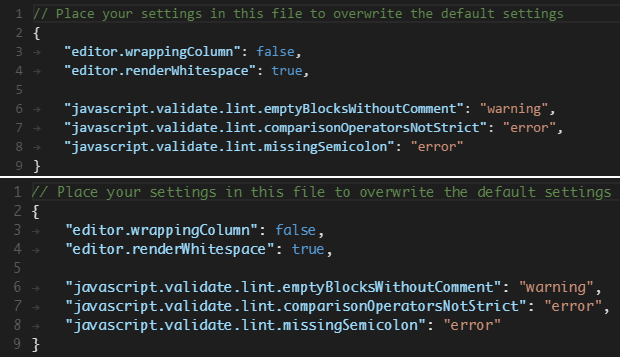 In VSCode if "editor.fontFamily": "" is blank, the font size will NOT work. Set a font family to change the size. Really, use whatever font family you like. Then "editor.fontSize": 16, should work. On my windows 8.1 machine default VS Code font is Consolas, but you can easily change the font in File->Preferences->User Preferences. setting.json file will be opened alongside with default settings file, from where you can take syntax and names for settings properties and set your own ones in settings.json. Settings fontSize to 12 and lineHeight to 16 closely approximate Visual Studio set to Consolas with 10pt size. I could not get an exact match (VS Code font is slightly bolder) but close enough. which confirms what Andy Li says above. You can specify a list of fonts, to have fallback values in case a font is missing. Not the answer you're looking for? Browse other questions tagged visual-studio-code or ask your own question. How to Set the Font of the Python Interactive Window? How do I set up Visual Studio Code to compile C++ code? How do I change Visual Studio Code environment's font size?